While cooking can be an enjoyable experience, it’s hard to find joy in prepping vegetables. Thankfully, vegetable choppers eliminate the tedious parts of preparing a meal, so that you can focus on the more creative cooking work. At ReviewLab, we tracked down the best vegetable choppers in several categories, including best overall, best value, best electric vegetable chopper, best multi-function vegetable chopper, and best blade vegetable chopper. Our picks represent the top products in each of these categories. Read more about our methodology. Make salads, salsas, and more in this easy-to-use vegetable chopper from Sedhoom. 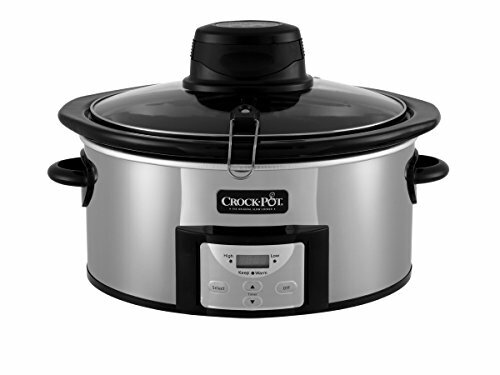 This model features an intuitive pull cord design that cuts minutes off vegetable prep time. Combine all your vegetables in the Sedhoom and chop together for instant results. This compact vegetable chopper from LOVKITCHEN lets you shred carrots in seconds, cut onions without tearing up, and even make your own bacon bits. The durable plastic design features a strong pull string and three sharp blades for fast, effective food preparation. Own a classic. This no-nonsense vegetable chopper from Kwik-kut is an effective – and inexpensive – way to simplify vegetable preparation. With durable stainless steel blades and sturdy, time-tested construction, our top pick for value is built to last generations. 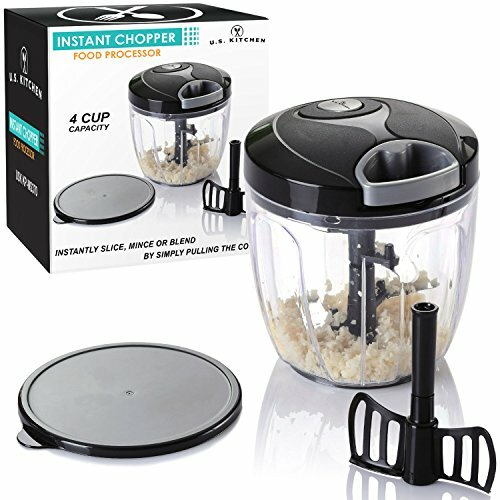 This high-capacity vegetable chopper from U.S. Kitchen Supply dramatically cuts vegetable prep times for easy, hassle-free meals. Chop vegetables, prepare salsas, and mix salads in seconds with this powerful pull-string model that’s also surprisingly budget friendly. Effortlessly prep vegetables with this powerful electric food chopper from Ninja. Chop, mince, and blend any vegetable in seconds by pulsing this tiny food processor, a cult favorite with smoothie and salsa aficionados. In between uses, it’s easy to store this compact model out of sight. This electric vegetable chopper from Hamilton Beach chops, minces, or blends up to 3 cups of vegetables at once for instant salsa, guacamole, or hummus. The powerful food processor is designed to minimize mess, making for easy cleaning and maintenance. Slice, chop, mince, and grate all kinds of vegetables with this versatile vegetable chopper from ALISKID. This handy kitchen tool includes five blade attachments, so that you can prep all your ingredients with just one appliance. 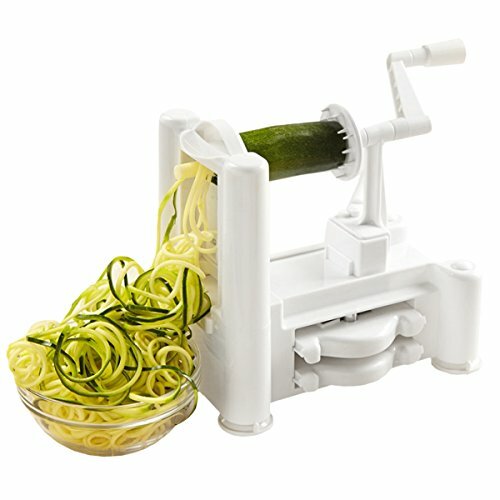 This vegetable chopper from Kinzi chops, slices, and spiralizes vegetables and fruits to create ingredients like apple slices and zucchini noodles. Simplify your food preparation with this high-quality, multi-function machine that’s made to take on a variety of tasks. Save time the old-fashioned way with this classic mezzaluna knife from HIC. Rock this simple blade vegetable chopper back and forth over vegetables to shave minutes off your cooking time. This durable model is made from stainless steel and finished wood. Make ribbed vegetable slices, wavy chips, and waffle fries with this hand-operated vegetable chopper from HIC. This sharp, stainless-steel kitchen tool adds a fun aesthetic appeal to everything from soups to salads to sides. The key differentiator between the types of vegetable choppers is their power source. Most manual vegetable choppers are powered by a pull-string. Just tug on the string and the chopper’s blades start spinning. Simpler manual choppers, like blade choppers, are more hands on. Electric vegetable choppers require either batteries or an accessible wall socket. Vegetable choppers hold anywhere from one cup of food to upwards of six cups of food. Before you decide which capacity is best, take a moment to think about how you cook. If you cook lots of small meals, a low capacity model is easier to use, clean, and store. If you cook big batches (for large groups or for canning or freezing), a high capacity model saves a lot of time since you can run it once and be done. While any vegetable chopper will, most likely, chop vegetables well enough, some vegetable choppers come with additional blades that add different functionalities to the chopper. These blades do things like dice, slice, and spiralize vegetables to create dishes like squash noodles and sliced vegetable platters. If you like to experiment in the kitchen, a vegetable chopper with multiple blades can save prep time and open new culinary doors. Working with sharp kitchen tools can be a safety hazard. While it’s difficult to get hurt using most vegetable choppers, choppers with exposed blades do present certain safety hazards. Whichever vegetable chopper you settle on, make sure you’re prepared to use it safely. A reliable, manual food chopper typically costs anywhere between $10 and $15. Add an electric motor to that chopper and the price point goes up a bit. Electric vegetable mixers typically fall anywhere between $15 and $25, although high-end and restaurant-grade food processors can easily top $200. The quality of the motor and the size of the appliance both have a huge effect on the price of electric models. The non-motorized, classic models offer, arguably, the best value. These stripped down vegetable choppers, which include old-fashioned blade choppers that consist of little more than a sharp metal blade and a handle, are the most affordable models. They rarely cost more than $5 to $10. 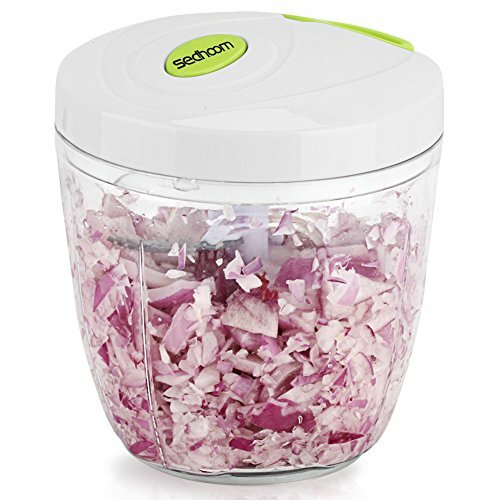 Shave minutes off your vegetable prep time by investing in our top overall pick, the Sedhoom Manual 6-Cup Food Chopper. This high-capacity vegetable chopper processes up to 4 cups of vegetables at one time, so it’s actually big enough to make an entire meal in. Just throw in your tomatoes, peppers, onions, and cilantro, pull the pull cord a few times, and – voila – salsa. People like this model because its reliable, effective, and quieter than the electric alternatives. High capacity. This high-capacity vegetable chopper processes up to 4 cups (1000 ml) of vegetables in one go. It’s easy to mix different vegetables together in the Sedhoom model and chop them all at once to make salsas or salads. Five sharp blades. This vegetable chopper features five blades for ultra-fine chopping. Durable pull string. To generate power for manual vegetable choppers like this one, you need to use the pull string quite often. This model uses a strong pull string that doesn’t snap with frequent use. Quiet. Unlike loud electric models, reviewers say that this vegetable chopper operates in near silence. 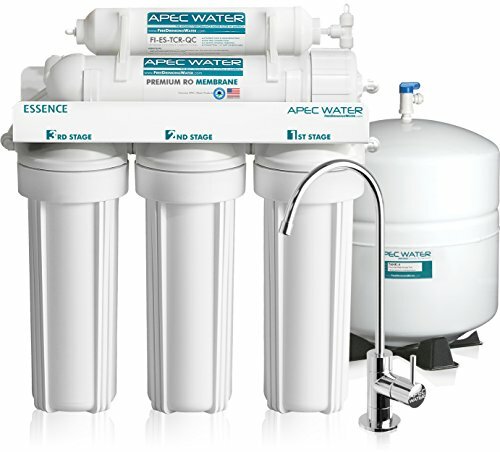 This makes it an ideal appliance for homes with babies or pets. BPA-free plastic. This vegetable chopper is constructed from durable, BPA-free plastic. It’s safe, then, to use in food preparation for small children. Pull string gets stuck. Some reviewers report that, after pulling the pull string all the way to the end, the string stopped retracting. To avoid this, try not to pull the pull string to the very end. 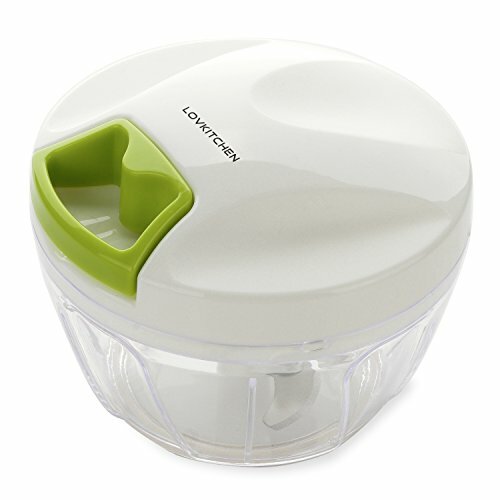 While it’s easy to tuck this tiny vegetable chopper away on a shelf, reviewers say that they use this LOVKITCHEN model so much that it barely ever leaves their kitchen counter. This vegetable chopper, which has a maximum volume of about 1.5 cups, strikes a good balance between capacity and functionality. It’s small enough to fit anywhere, but large enough to handle larger vegetables like onions and peppers comfortably. The LOVKITCHEN makes chopping individual vegetables a breeze. Compact. This compact vegetable chopper processes up to 1.5 cups (400 ml) of vegetables at once. It is the ideal size to chop onions, peppers, and other large vegetables. Durable pull string. The power for manual vegetable choppers like this one comes from its pull string. This model uses a sturdy pull string that, reviewers say, doesn’t snap with frequent use.??????? Quiet. Unlike loud electric models, this vegetable chopper operates in near silence. It’s an ideal appliance, then, for homes with babies or pets.??????? BPA-free plastic. 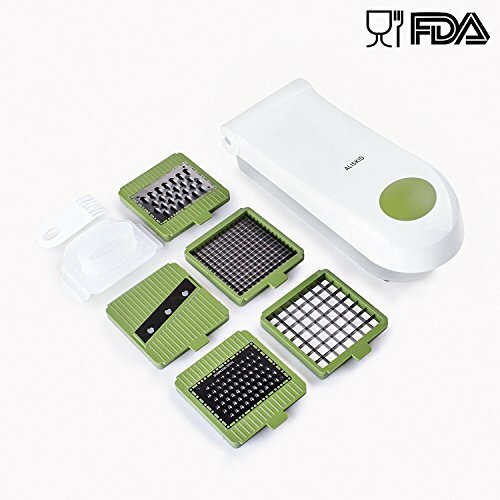 Prepare food for your family with peace of mind, since this vegetable chopper is made of FDA-approved, BPA-free plastic. Low capacity. While this vegetable chopper can processes up to 1.5 cups of vegetables in one go, it’s body is just too small to process whole vegetables. Reviewers complain that they have to cut onions into quarters before they fit in the machine. Three blades. While three blades are plenty for processing most vegetables, reviewers doubt the blades could handle harder foods like raw potatoes and beets. Your grandma might have used something like this Kwik-kut vegetable chopper to prep your favorite family recipes back in the day. This classic design has staying power for a reason: it’s effective, low-maintenance, and lasts forever. This vegetable chopper is a practical, budget-friendly option for cooks who don’t mind a more hands-on experience in the kitchen. While it may require more elbow grease to use, the Kwik-kut is easier to store, clean, and sharpen than its pull-string and electric counterparts. Durable. Reviewers say that their Kwit-kut vegetable choppers have lasted decades. This simple design is easy to clean and maintain, which makes it the ideal heirloom kitchen tool.?????? Easy to clean. Unlike pull-string and electric vegetable choppers, this model is very easy to clean. All it takes is a quick rinse.??????? No nonsense. Reviewers love this kitchen tool because, although it lacks the bells and whistles of other vegetable choppers, it gets the job done well.??????? Made in America. These classic, stainless-steel vegetable choppers are manufactured close to home. Simplistic design. Although the Kwik-kut’s genius is its simplicity, some reviewers say simplicity is also the vegetable cutter’s weak point. According to some reviewers, the square, bare-bones design isn’t particularly ergonomic. Like other pull-string models, this manual vegetable chopper makes easy work of tedious vegetable preparation. Just give the pull string a couple tugs and you’re ready to roll. If you like the pull-string concept, but can’t justify the price points of our top overall picks, this inexpensive vegetable chopper is a solid alternative. The model also includes two useful attachments – a whisk and a lid – that make it easy to mix and store ingredients. High capacity. This high-capacity vegetable chopper can handle up to 4 cups (1000 ml) of vegetables at once. Reviewers like to combine ingredients in this model to make salsas and other recipes instantly. Useful attachments. This model features a whisk attachment for eggs and smoothies and a secure lid to keep chopped vegetables fresh in the fridge. Durable pull string. This vegetable chopper features a strong pull string that doesn’t snap with frequent use. Quiet. Electric vegetable choppers are noisy. This manual vegetable chopper, on the other hand, operates in near silence. This makes it an ideal appliance for homes with noise-sensitive babies or pets. Pull string gets stuck. Some reviewers report that, after pulling the pull string all the way out, it stopped retracting. Avoid pulling the string too far when you use this vegetable chopper. Budget construction. While this vegetable chopper comes with attachments that more expensive pull-string models lack, U.S. Kitchen Supply’s construction doesn’t quite rival the construction of our top overall picks. Ensure a fast, consistent cut every time with an electric vegetable chopper. Tough vegetables, like carrots and beets, are no match for the electric vegetable chopper’s fast-moving blades. Chop, mince, grind, and blend any vegetable with one of these sturdy kitchen appliances. 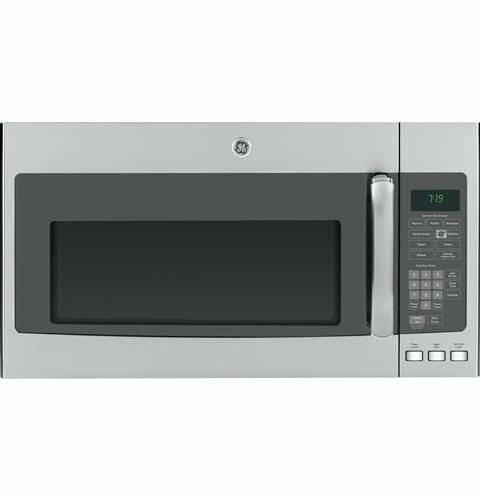 These powerful appliances feature built-in electric motors for hassle-free, hands-off operation. Electric choppers typically process food faster than manual choppers, which makes them the ideal tool for chopping large batches of vegetables. This electric vegetable chopper packs a punch. Chop, mince, or blend almost any food – including vegetables, meats, and nuts – to make dishes like salsa, guacamole, and hummus. This compact model fits comfortably in the cabinet, so you can access it easily at any time and, then, tuck it away when you aren’t using it. This vegetable chopper is incredibly easy to use, since the machine is completely hands off. Enjoy ergonomic, one-touch pulsing with this high-tech kitchen gadget. Compact. This compact machine processes about 1.5 cups (400 ml) of vegetables at once. 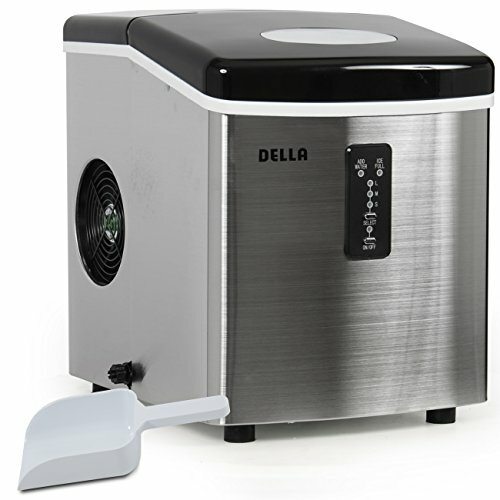 This makes it the ideal size to process single vegetables and small batches. One-touch pulsing. Reviewers love how little effort this vegetable chopper requires. Forget using a knife, you don’t even have to pull a string to run this ergonomic vegetable chopper. Powerful 200-watt motor. 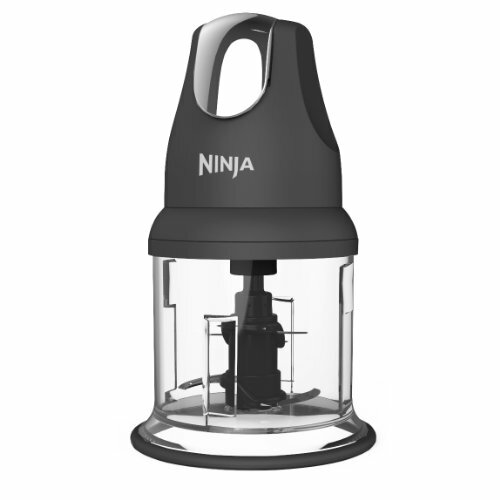 Most reviewers report that the 200 watt power pod on their Ninja vegetable chopper has lasted for years. Easy mincing. The blades on this electric model move much faster than the blades on manual models. It’s easier, then, to mince and blend vegetables in this vegetable chopper. Difficult to clean. Some reviewers warn that, despite the manufacturer’s claims, this vegetable chopper isn’t dishwasher safe. They also say it’s difficult to clean the lid (which contains the motor) thoroughly by hand. 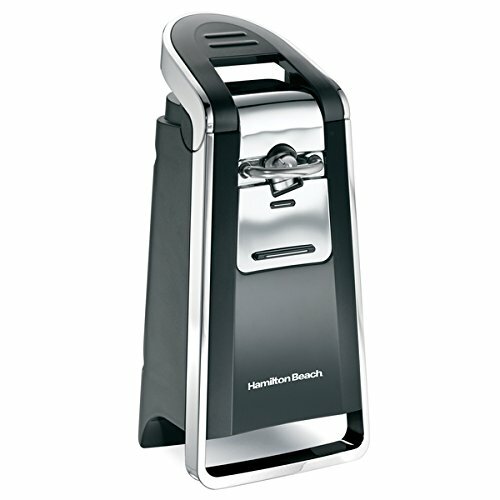 Make all your favorite recipes in this high-capacity vegetable chopper from Hamilton Beach. Not only does this machine handle vegetable preparation with ease, it’s also large enough to handle entire meals. Size isn’t the only thing going for this powerful appliance. The Hamilton Beach Stack & Press Chopper is also easy to clean and maintain, since the bowl of the food processor is completely separate from the motorized base. This classic food processor makes food preparation quick and painless. High-capacity. This machine processes about 3 cups (700 ml) of vegetables in one go. Make salsa, guacamole, and other recipes quickly by combining all the ingredients in this vegetable chopper. One-touch pulsing. This vegetable chopper is perfect for seniors, since it doesn’t require physical strength to operate. Powerful 350-watt motor. 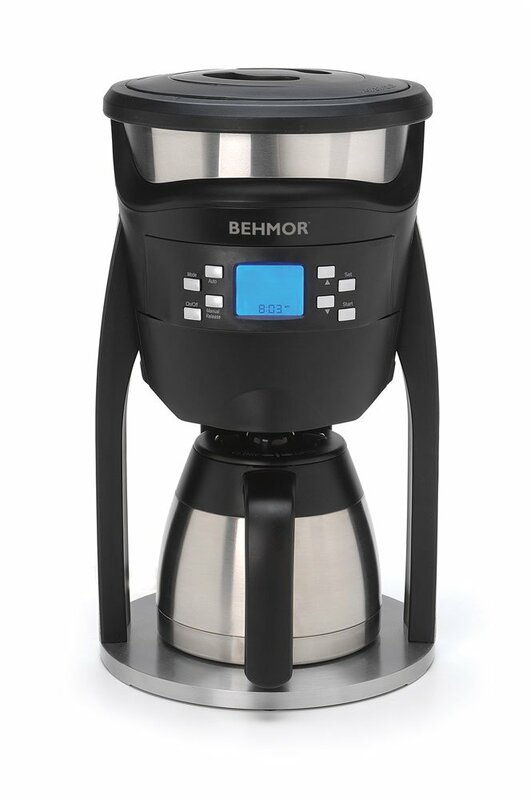 A powerful, 350-watt motor makes mincing and blending a breeze with this machine. Easy to clean. The bowl of this vegetable chopper is completely separated from its motorized base. Reviewers say it is much easier to clean than alternatives like the Magic Bullet and the Ninja. Minces better than it chops. 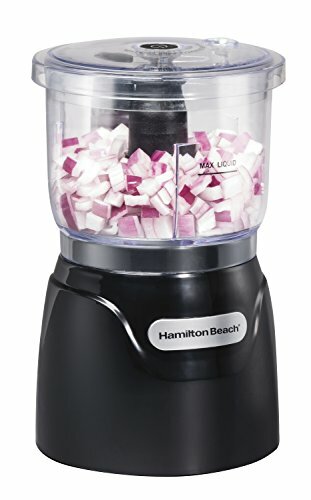 Some reviewers say that, although this Hamilton Beach model minces vegetables to perfection, it’s difficult to coarsely chop vegetables with the powerful machine. A multi-function vegetable chopper doesn’t just chop, it also dices, slices, and spiralizes vegetables with ease. From fresh salsa to zucchini noodles, make a wide range of dishes – without resorting to a wide range of appliances – with one of these versatile choppers. These appliances typically come with multiple attachments – including a chopper, a grater, and a shredder – so that you can select the most appropriate cut for whatever’s on the menu. With five different blade attachments, this vegetable chopper is a highly versatile tool that simplifies food preparation for many, many recipes. This kitchen tool is hand operated, which makes it easier to control the type of cut you make. Get consistent, even results every time with this popular vegetable chopper from ALISID. The tool is made from stainless steel and FDA-approved, BPA-free plastic for durability and safety. It also comes with a good refund and return policy for risk-free shopping. Comes with five different blade attachments. Prep vegetables for any recipe with this versatile tool. This vegetable chopper comes with five different stainless-steel blade attachments for slicing, chopping, mincing, grating, and ultra-fine grating. Noiseless. Unlike electric and pull-string models, this hand-operated kitchen tool doesn’t make noise. It is, then, the ideal solution for homes with infants or sensitive pets. BPA-free plastic. This vegetable chopper is made of FDA-approved, BPA-free plastic. It’s safe to prepare food for children with this durable kitchen tool. Good refund and return policy. ALISKID offers a decent refund and return policy, so you can try this product risk-free. Low capacity. Some reviewers complain that the container on this vegetable chopper doesn’t hold large batches of vegetables. Some cooks have to empty the small container several times during preparation. Attach one blade to chop vegetables for soup. Another to slice cucumbers for a salad. And a third to spiralize zucchini for a low-carb noodle alternative. This versatile vegetable chopper goes above and beyond to perform a variety of tasks that make cooking any meal easier and more enjoyable. This sturdy appliance features sharp German-milled, stainless-steel blades, a stable plastic base that attaches to the kitchen counter with suction cups, and a strong crank for easy, noiseless operation. Comes with three different blade attachments. This vegetable chopper comes with three German-milled, stainless-steel blade attachments for slicing, chopping, and spiralizing vegetables. Noiseless. This hand-cranked kitchen tool is virtually noiseless, which makes it the ideal solution for homes with infants or pets. Stable base. Powerful suction cups hold this vegetable chopper securely in place on laminate, marble, and other surfaces. Reviewers say this machine doesn’t skid or wobble on their kitchen counter. BPA-free plastic. This vegetable chopper is made of FDA-approved, BPA-free plastic. It’s safe to prepare food for children with this well-made kitchen tool. Plastic construction looks “cheap.” Some reviewers complain that the white plastic construction makes this machine look cheap. Sometimes nothing beats simplicity. For centuries, this classic vegetable chopper has been a staple in kitchens all over the world. Take the versatile blade vegetable chopper to vegetables, fruits, garlic, fish, or meat for clean cuts that shave minutes off your cooking time. Due to its simple design, the blade vegetable chopper is also durable, easy to clean, and easy to sharpen. Today’s blade choppers also feature contemporary elements like ergonomic designs and new materials. Mezzaluna knives, like this one, have been a part of Italian and French cooking for centuries. Not only do they chop vegetables with ease, the versatile knife is also handy for cutting the meats and herbs that are so important to these cuisines. While, nowadays, there are far more “advanced” vegetable choppers on the market, the mezzaluna hasn’t lost its faithful following. People all around the world still use this ergonomic knife to prepare vegetables with ease. Intuitive design. It’s easy to pick up the rocking technique that gives this vegetable chopper its bite. Reviewers say they mastered the technique after just a few uses. Easy to clean. This vegetable chopper is very easy to clean, which makes it both more hygienic and longer lasting than its more complicated alternatives. Simple construction. Although the mezzaluna is less complex than electric and pull-string vegetable choppers, it’s just as effective. It’s also easy to keep this knife’s stainless-steel blade sharp. No sheath. This mezzaluna doesn’t come with a sheath, which means it’s difficult to store it safely. Without protection, it also loses its sharpness faster. 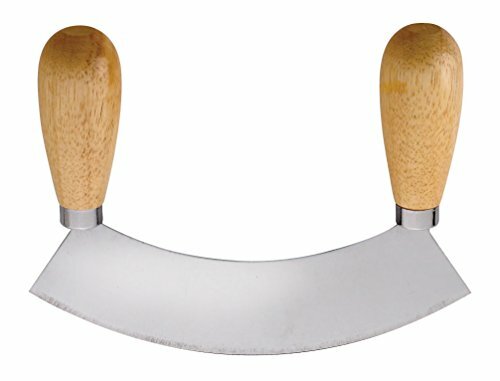 This unique vegetable chopper has a crinkled stainless-steel blade that injects a little fun into monotonous vegetable preparation. 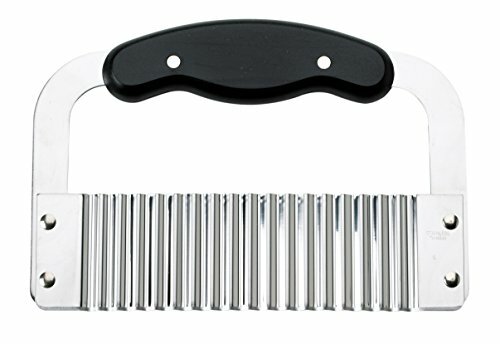 This kitchen tool slices and chops, so you can create ribbed vegetable slices for salads and crinkle-cut vegetable bits for soups and roasts. Although it takes some technique to create even cuts with this tool, the simple design is – overall – highly intuitive. It’s easy to keep this sleek, dishwasher-safe vegetable chopper clean by rinsing it thoroughly after every use. Unique results. 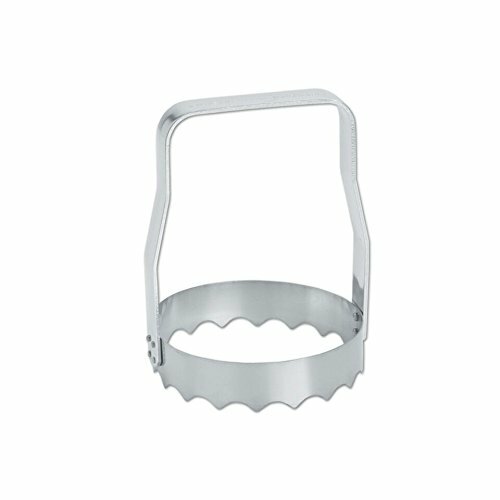 From bread and butter pickles to waffle fries, reviewers love the unique results they get with this crinkled vegetable chopper. Straightforward design. This simple vegetable chopper is little more than a sharp, crinkled blade and a sturdy handle. While it lacks the additional features that attract people to more complex models, this crinkled cutting tool is – for many – far more intuitive. Easy to clean. This vegetable chopper is dishwasher safe and easy to clean by hand, which makes it more hygienic than other, more complicated alternatives. A clean vegetable chopper also rusts later and lasts longer. Difficult for some to use. Some reviewers report that, due to the simplistic construction of this vegetable chopper, their hands sometimes slip while they’re prepping vegetables. It requires some technique to use this model effectively.